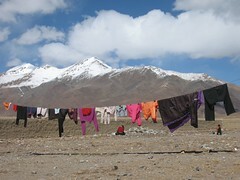 In a matter of hours, we traveled from dead winter to a cool humid summer; from the sterility of the Tibetan Plateau to the moldy chaos that was Nepal. 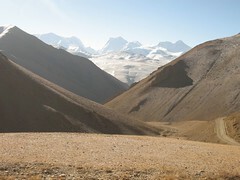 Six weeks have passed since we first ascended to the Aksai Chin; barely a word have I written. Can I recall now, the stress, the struggles and ultimately, the sense of accomplishment of that dream, that severe dream, that never-ending emptiness that was the road to Kathmandu? "You know," I said to Chris, who lay shivering in his sleeping bag next to me on our last night at 4800 meters, before I buried my face in my bag, choking back tears. "What's the matter?" Chris sounded concerned for me in our fragile environment, our tent hastily erected in the dark, single digit night. 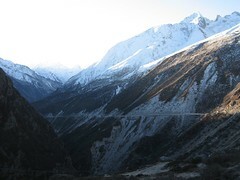 We had crossed the last two of the plus-5000 meter passes in a Chinese apple truck, headed to the Nepal border. Although we had paid for a ride about 135 kilometers, the falling darkness alarmed me and I was suddenly possessed with the sense that we should not descend off the Plateau under cover night, in a rattly but warm, orange colored truck. In my desperation to escape the wind, I had lost sight of what was important to me, what I had come for. 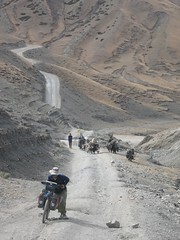 Besides the opportunity for endless eating- when food was available- I wanted to ride "the longest downhill in the world." I was sure I'd regret this forever, after all the struggle and time it took to get where we were, if we just anti-climatically coasted on in the dark without seeing, without experiencing, without savoring the transition. Chris, on the other hand, had been done with Tibet for weeks, and was ready to take the lift the full 280 kilometers to the Nepali border. But ever agreeable and accommodating, he agreed in the moment to stop the truck and get out, before we'd lost any more precious meters of elevation. Under the dim beams of our headlamps, with frozen fingers and brilliant stars, we scuffed the ground at the side of the road looking for a place somewhat level and free of large rocks. There'd be no hiding from the wind. The wind which sent us hitching in the first place, scrapping our grand dreams of tackling those last two passes and making the final 7 day stretch from Lhatse to Kathmandu under our own power. 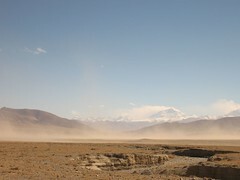 The wind which nearly defeated us on our first pass out of Lhatse- a lung-busting, 1200 meter, 31 kilometer climb (after a week below 4000). The climb which started out dreamlike: a paved, moderately graded, smooth new road with a tailwind, but turned into a nightmare as our tailwind turned on us 10 kms from the top and caused us to walk, to stagger dizzy, and to stop and hold our footing when it gusted up to 50 mph. We perservered that day although we never made it to the comfort of an indoor night. We toughed it out in a hasty camp, erected after pedaling hard downhill into the headwind, and managing only 10 kph. No way would we reach Shekgar that day. 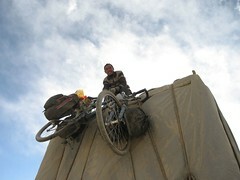 We did arrive there the next night, after more battles with wind and the added demon of sand gusts. Sharp grains blasted full force in the face until we'd surrender motionless, pursing lips tight against the grit which tried to find its way into any available crevice. At least the scenery was dramatic. Every turn of the road revealed a changing view of variously hued sandstone peaks with caramel ridges and a brilliant blue sky. On the third day after Lhatse, things were no better. Our steady climb was on a deteriorating road- the perfect pavement having ended the day before, and the vistas flattened out into monochromatic hills. 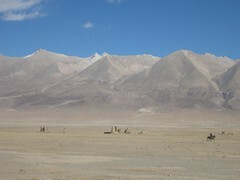 The occassional ruins that punctuated the view were not enough to sustain us in face of the relentless and powerful headwind. The Wicked Wind of the West. We hid for an hour in a dry bend of a monsoon drainage, jumping up to hitch at the few passing vehicles while we ate biscuits and our last crisp Chinese apple. Finally we faced the music and got back on the bikes. So when the orange apple truck came by, neither of us hesitated to pay the $25 dollars the driver wanted to get us away, far away, from this trial of effort. 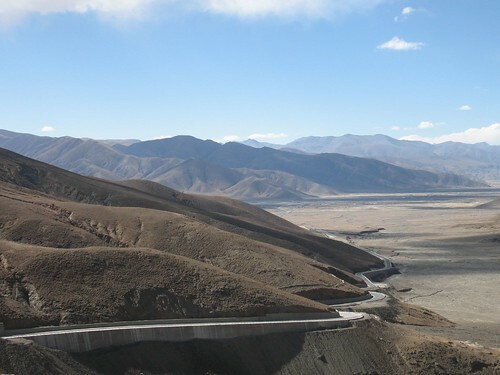 And as we saw the condition of the road- ever sandier from the deposited blow by, ever corrugated as it went up- we were pleased to be riding in our last Chinese truck. I couldn't answer Chris, choked up as I was. I could only shake my head. "Those are happy tears?" He was confused. I nodded, butI was silent. "Tell me what's going on so I can try to understand." After a time, I was finally able to explain. "You know, I am so glad that you agreed to get out of the truck," I started. And I went on to tell him how emotional the whole experiece was. 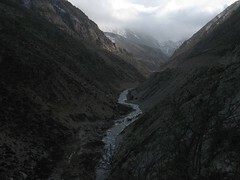 Of realizing that we had come to the brink, to the edge, and after this night, we would be coasting down, off the Tibetan Plateau, our home for more than a month and a half. How glad I was to be able to extend the end for one more night, under the billions of stars, in the freezing ruins of our last camp. What I have to say here are my truthful thoughts about Tibet. I feel a bit remorseful expressing them, because some people will shout at me and tell me that I shouldn't say what I don't know. Well, I admit I know little about the political situation- we heard that jobs go to Chinese, not Tibetans; we met a Tibetan girl schooled in Nepal who was denied the opportunity for university study in Lhasa; we met a Tibetan driver who was not allowed to sleep in the Chinese hotel with his foreign tourists and interpreter - but I do know my impressions and my feelings, and that is what I report here. Of course we met other travelers who felt much differently about all this. But that's them. 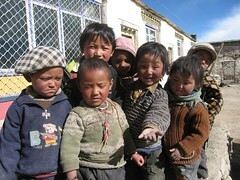 So the truth is, we really didn't have a good impression of the Tibetan people. As I wrote previously, smiles were free but hellos cost. A common greeting was, "Hello. Money" Sometimes just, "Give me money." Often people didn't wave with their arm raised and their palm forward. The hand would be out, palm upward. The give-me-money position. Probably the hordes of 4WD tourists who've been passing this way in recent years have felt a compassion or duty to these oppressed people, and have freely haded out small notes of Chinese yuan. But we found it offensive and irritating. And the lack of any hospitality was clearly disappointing. Only once were we offered a cup of tea without strings attached, from two shepherds huddled by their dung fire who invited us to join them for a cup of their salty, yak butter brew. In stinging contrast was the family who housed us for a night when we crested a 5200 meter pass in the toe of a snowstorm to find no descent on the other side. "How much?" the man asked when he showed me the mattresses in the barn-like room, two skinless animal carcasses hanging above the makeshift beds. We agreed on a price and then he showed us into the family's main room, with a warm fire in the center stove. They were drinking tea which we only were served after Chris fished our own cup out of the bike panniers. Did they really have no extras? Or did they just not want to wash one. It seemed that when their dinner was ready,was when they ushered us out into our quarters. And for the rest of the evening and again the next morning, different family members and neighbors took turns staring at us at a close distance, and after I yelled at the kids and scolded the parents, observed us by flashlight through the window. A most unpleasant night that sent us riding away early, long before any breakfast found its way into our hungry bellies. It was no better in towns. Being overcharged for everything got old. As did egg fried rice, pork fried rice and noodle soup for breakfast. And on the road- especially on the section between Lhasa and Kathmandu known as the Friendship Highway, we tired of dodging the children playing in the road. Their favorite game was a version of Red Rover. They'd stand holding hands across the road, a form of group Chicken that invited us to aim right at their joined hands. They'd of course, scatter when we didn't swerve away, and then immediately chase us down and try to grab hold of our bikes. Chris would just ride faster and get away. I resorted to using my scary voice, getting off the bike and making threatening sounds. It never quite got to rock throwing, but it did get as bad as rock picking up. One time, I found myself swatting at them. Me! A teacher who actually really likes kids. To be fair, there were some exceptions. We stayed in a hotel in Sigatse, the last main town before Lhasa, some 260 kilometers to the east, having arrived there hours after dark. 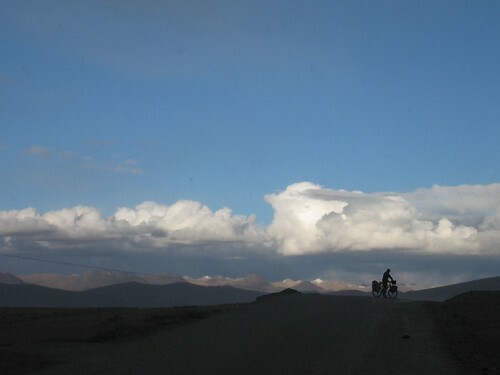 We had set out from Lhatse (140 kilometers to the west)early that morning, intending to make the two-day ride in one day by hitching late in the afternoon instead of camping. It was perfect- a goorgeous lake at the top of the small pass, and an empty flatbed truck stopping for our outstretched hand at the 67 km point, where Chris had just fixed a flat. Or so it seemed. The driver's eyes made me suspect. His chain-smoking and freezing wide window opening added to my concern. His eye-rubbing prompted me to suggest he put a cassette in the tape player and turn up the volume. But when the oncoming truck flashed lights at us as we drifted stright towards him, and I saw the driver slumped over the wheel, my cries of, "Wake up! Wake up!" caused Chris and I to look at each other and make a new plan. At the top of the next pass, at the yellow and back road sign indicating a steep descent, we spontaneously told the driver to stop and we got our things out of the flatbed as politely and quickly as possible. Better to ride what we thought would be 37 downhill kilometers in the dusk than to risk rolling off the road into the great beyond. The driver was very confused. But we were certain, and we quickly dressed for the evening descent. Which turned out to be mostly uphill after we came off the pass. As we were headed east, we had the long glowing sunset behind us. And when it became truly night, we had the luck of a road recently paved and newly striped. Chris was able to follow the white line, and I was able to follow his rear pannier reflectors. We rode in synch, he blocking the (of course) headwind and leading the blind through the night. Approaching the town of Sigatse, illuminated in the plain below us as we crested the last of the climb, I occassionally had to stop to regain my balance. Without visual reference to passing grass and trash on the roadside, I found riding downhill in the dark to be a perceptual challenge. We arrived to a lighted strip and began the task of trying to find a hotel in Chinese in the dark without a guidebook or a map. Following successive pedestrians' kind directions, we were on a promising street when we asked a soldier standing by his fuel tank truck. As we couldn't quite understand each other, he chose another way to explain. "Follow me," he indicated, and he jumped into the tanker and fired it up. Only 400 meters down the road he pulled over and waited on the street with Chris until I had the chance to check out the rooms and he knew we were satisfied with the hotel. 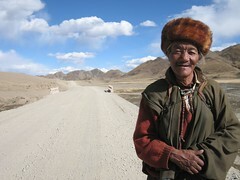 The young woman administrator, a Tibetan girl who knew some English, proved to be one of the exceptional people we met. 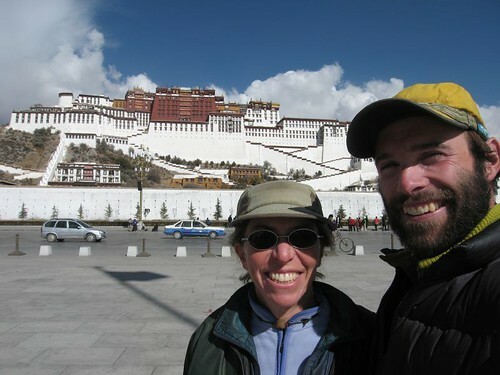 Not only did she give us a refund after we paid the agreed upon discounted price when we checked out the first time, and let us leave our cycles in a staff bedroom for the three days we went to Lhasa and back, by bus. Now only that, but she opened herself to us so that we really felt the friendship. 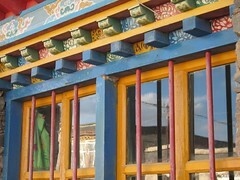 We stayed there again for one more night after returning from the Tibetan capital. And when she saw me scraping the last of the lipscreen out of the tube, she ran next door and bought me a delicious smelling, Chinese lip gloss as a gift. This kind of encounter was truly appreciated. But it was not enough. I guess in the end, it was like Chris said- he was tired of having to fight for everything. Fighting the wind, the cold, the dust, the wind. Fighting for a fair price, for correct change. Fighting harassment by everyone wanting a handout. Fighting altitude. 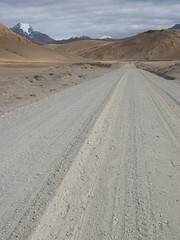 Fighting sand and washboard roads. Fighting for every meter of forward progress. Even fighting hunger and discouragement. We fought the good fight. But as we went down and down, off the plateau; as the sight of green returned, and the scent of vegetation came towards our ancient smellbrains; we reawoke to the land of the living.